We couldn’t just leave them there. “It is Earth Day, after all,” I shrugged and that set us in motion. The newly hatched babies can’t last long without access to water and there was no way Mother Goose was going to be able to safely navigate her brood through the parking lot and across multiple roads to the closest pond or lake, especially without the help of her mate who was no longer in the picture. “Well, what do you want to do?” But we both already knew the answer before the Handy Man even asked. We couldn’t just leave them there. “It is Earth Day, after all,” I shrugged and that set us in motion. The employees at Home Depot kindly gave us a large empty box to transport her and after a brief debate about who would take off their shirt to cover her with (I won, for obvious reasons), and a little strategizing, we quickly secured Mother Goose and her seven goslings to the box. She was weak and easy to catch. Too easy, really. We decided to relocated them to the security of our backyard for the night, and asses further action in the morning. We ushered our ducks to the safety of their house and set her up a hay nest next to the small man-made duck pond where she could sleep peacefully for the night. 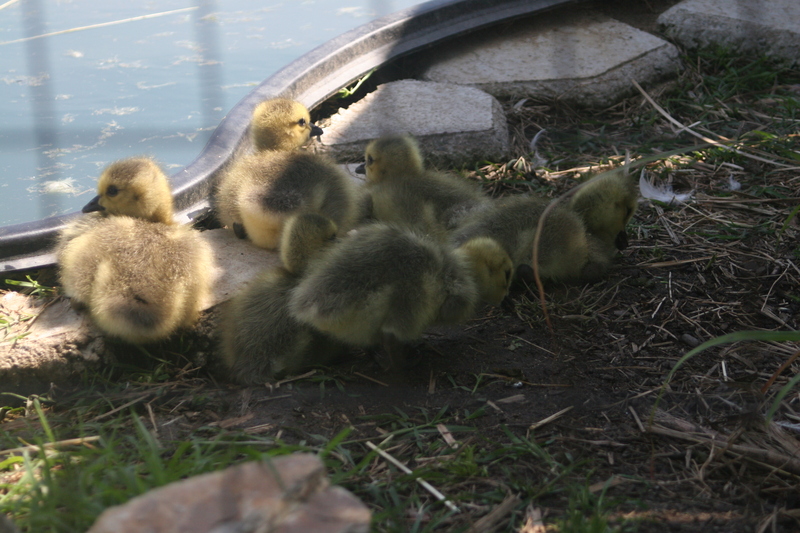 The next morning we awoke to all seven goslings playing boisterously in the pond, devouring the unmowed grass. The rest of the farm was intrigued by the visitors, but kept their distance. This fairy tale ending made it all worth it, though. This isn’t an uncommon problem for geese. Over hunting and loss of habitat took its toll and by the 1950s they were believed to be extinct until, in 1962, a small flock was found in Minnesota and a breeding and release program was established. They have rebounded, but still have on going issues with habitat disruption. 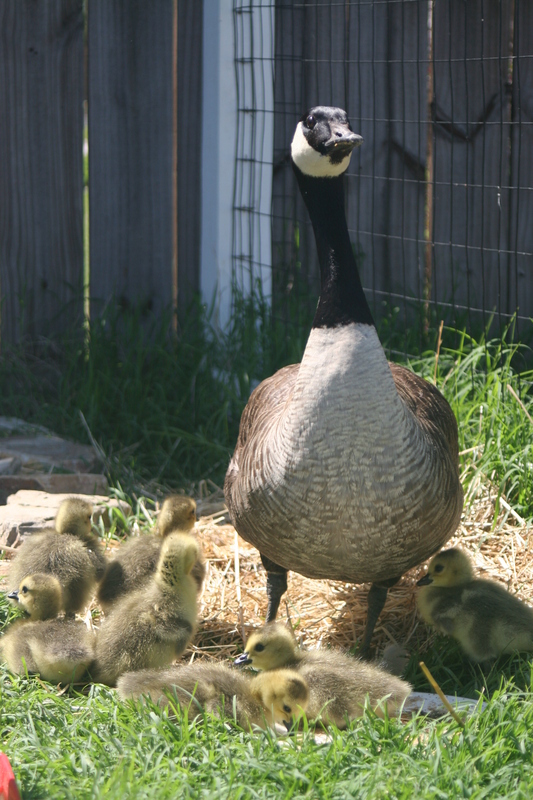 In the US, these geese are largely considered pests due to their droppings, noise and confrontational demeanor in urban environments. 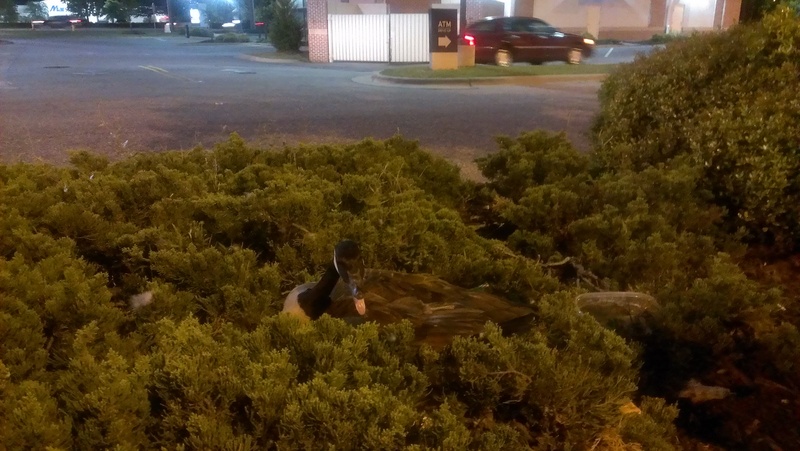 As suitable nesting habitats dissipate, geese have turned increasingly to man-made havens. Do not feed them! These are wild animals. You do not want them becoming dependent on human food, nor do you want to give them food that is damaging to their very complex digestive systems. Bread is a big no-no! The goal is to guide them safely to an area where they have the ability to feed themselves and their babies appropriately. Do not remove a goose from its nest if the eggs have not hatched. Wait until all eggs have hatched before relocating the bird. Any disturbance to the nest and eggs will likely result in death to the unhatched birds. Do not separate the goose from her goslings. 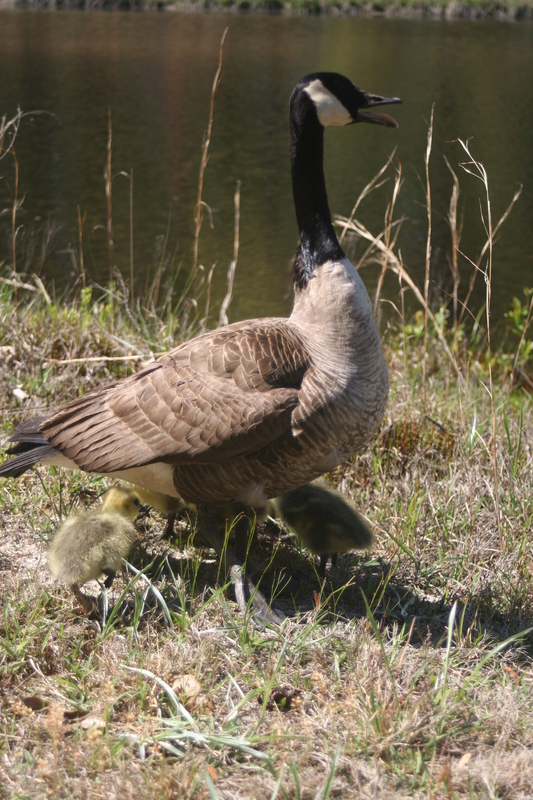 This causes obvious emotional trauma for the parents and the goslings, who rely on their parents for protection and food. Goslings left to fend for themselves fail to develop proper socially, struggle learning basic flight skills and become non migratory without someone to teach them the complex migratory patterns. Make sure to relocate the gander with the goose and goslings. Geese are monogamous and mate for life around the age of two. 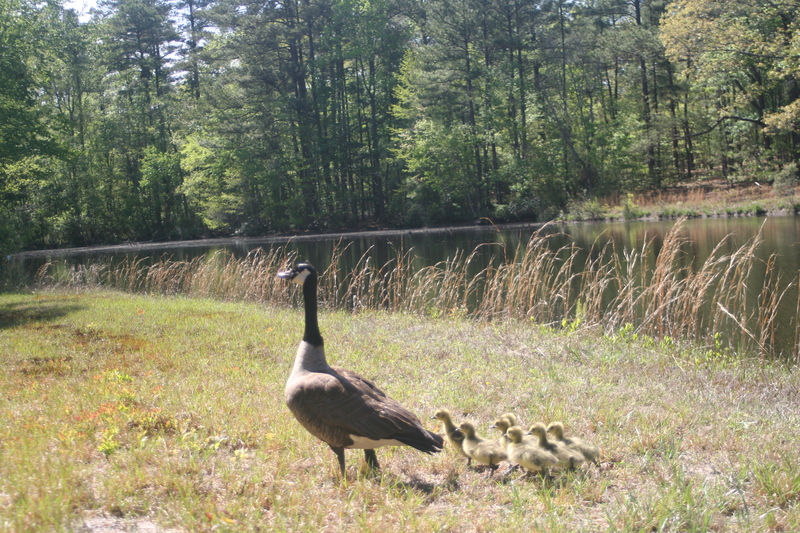 The gander shares incubation responsibilities and helps raise the goslings, so taking his family away from him would be devastating to everyone involved. If you can not locate the gander or truly do not believe he is still in the picture, all is not completely lost. The goose will go through a period of morning and likely find a new mate the following year. Limit physical handling as much as possible and do your best to mitigate the stress of the situation. It is preferable to gather a group of people to gently herd the geese away from hazards to a near by body of water verses capturing and relocating. Hailey313 and biophiliac like this. "Cute story but not LC material"
Love the Jurassic Park video! Great connection! 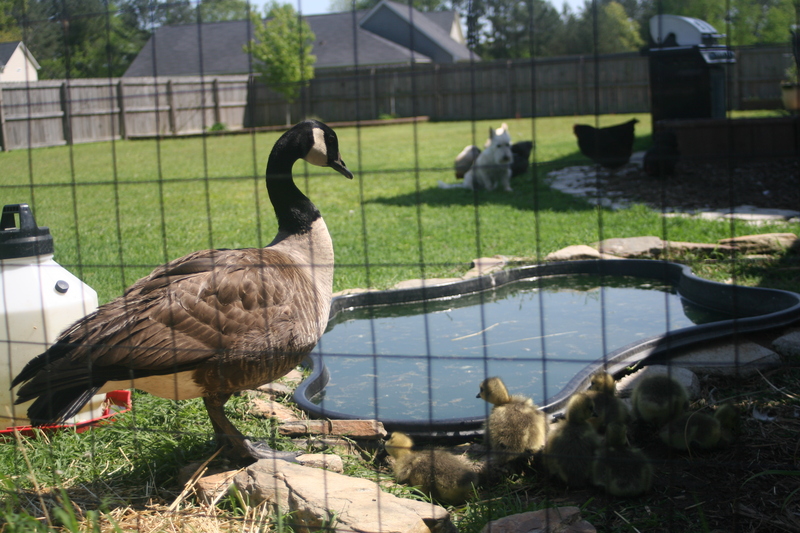 Sweet how you rescued her and her goslings; the pictures are sweet. Thank you, NorthFL. I'm glad you enjoyed it. These are truly incredible animals; we were happy to be stewards when the need arose and hope to empower others with the information they need to do the same. An entertaining story and helpful information...I like it! Good article, thanks for sharing your goose encounter and the tips.